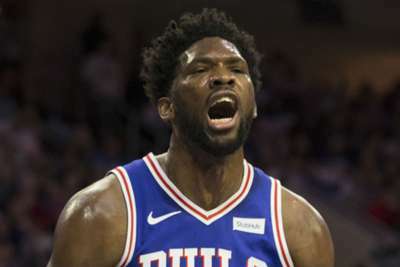 Philadelphia 76ers All-Star Joel Embiid will face the Brooklyn Nets in Game 2 of the NBA Eastern Conference first-round series. Embiid – who has been dealing with knee soreness – was named in the starting five for Monday's clash in Philadelphia. The 25-year-old was "a game-time decision," 76ers head coach Brett Brown told reporters. He went through drills during warmups. Embiid was listed as "doubtful" for the first game of the playoff series. But, he took the floor and tallied 22 points, along with 15 rebounds as the 76ers were shocked 111-102 by the Nets. He missed five of the 76ers' last seven regular-season games. Brown described Embiid's injury as a "slippery slope" when he met with reporters after practice on Sunday. "We are the recipient of Jo trying to inch along slowly and buy time," Brown said. "You win a game, two more days, you win a game, three more days, you might drop one, four more days. How do you deliver him responsibly to a later date in ultimately what you hope will be a deep playoff run?"